McKelvey is founder of Third Degree Glass Factory, one of the nation’s main centers of glassblowing arts. His own trademark hand-blown glass faucets can be seen in homes from Abu Dhabi to Mill Valley. McKelvey also founded Mira Digital Publishing, an early digital technology startup, where he gave a young programmer an internship and a place to hone his tech skills. That programmer, Jack Dorsey, went on to create Twitter and partner again with McKelvey in the development of the Square Payments Platform. McKelvey, and his wife, Anna (a programmer and attorney), have a four-year-old son. What’s stopping you from doing what you would like to do? We no longer need to ask anybody permission to do anything. The tools that exist today thanks to the Internet allow you to get started by ourselves and to learn as we go along, at our own pace. Jim noticed a very talented artist who was living in his beat up car and wondered why. He was a talented artist who could be getting paid well for his work. Why wasn’t he? Jim realized the artist had no access to the systems that paid him. 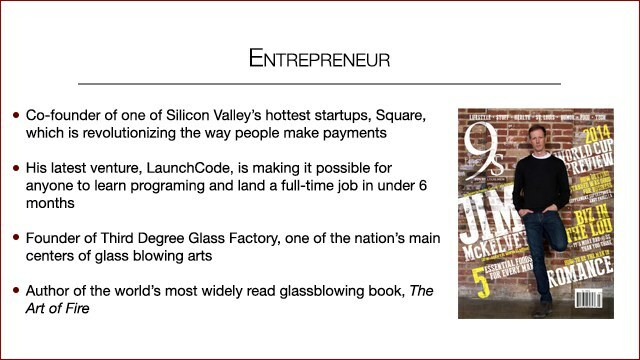 As he built Square, Jim always kept this one artist in mind and thought about how he was solving this one artist’s problem. Getting out there and trying to build is one of the best ways to get started on learning technology skills. You don’t have to quit your job. See if your employer has time set aside for personal learning. Join a hack-a-thon and start tinkering. Just try building something.